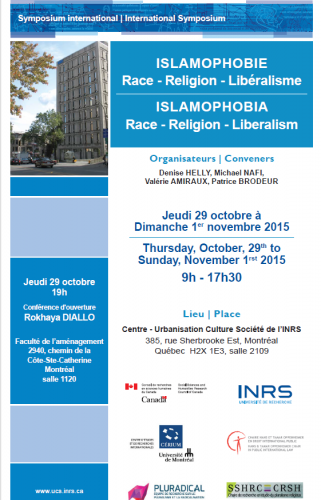 From October 29 to November 1, 2015, Denise Helly (INRS), Michael Nafi (John Abbott College), Valérie Amiraux et Patrice Brodeur (Université de Montréal) invite you to join them for an international symposium on islamophobia. The symposium will be inaugurated on October 29 at 7:00 pm with a keynote presentation by the renowned French journalist, documentary-maker and activist Ms. Rokhaya Diallo, in room 1120 of the Pavillon de la Faculté de l’Aménagement, Université de Montréal, 2940 Côte-Ste-Catherine road. Within a particularly tense climate on this issue in Quebec, this interdisciplinary conference will probe the nature and foundations of islamophobia. What is islamophobia precisely? Is it a rejection of immigrants from Arab countries, the expression of anti-Muslim sentiment, a form of essentialism, a cultural racism echoing 19th-century antisemitism, or a new manifestation of Western racism? Is it the hatred of religion, faith dogma or a broad animosity towards pious subjects whose continued presence in Western democracies challenges the postulates of modernity and political liberalism? Does islamophobia stem from misconceptions of social and political conflicts in Muslim countries, misconceptions that are sustained by pseudo-academic orientalism and inadequate media coverage? For more information or to see the detailed program, please visit the INRS website.